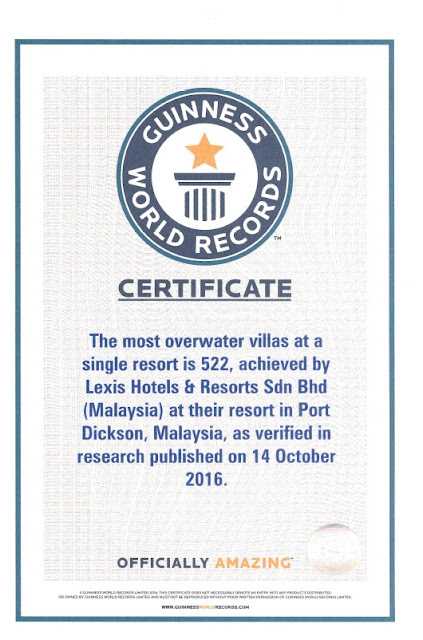 Officially recognised by Guinness World Records for having The Most Overwater Villas At A Single Resort, Lexis Hibiscus Port Dickson (LHPD) should be every A-lister's resort of choice. 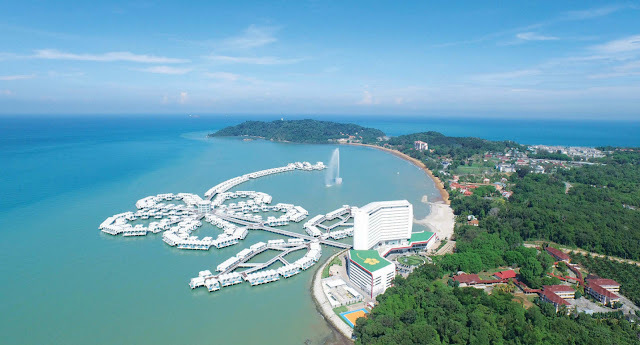 Nestled along Port Dickson's Pasir Panjang shoreline, overlooking the Straits of Malacca, Lexis Hibiscus PD is about 1.5 hour's drive from Kuala Lumpur. A winner of the much coveted World Luxury Hotel Awards, LHPD proves its success is hard earned. 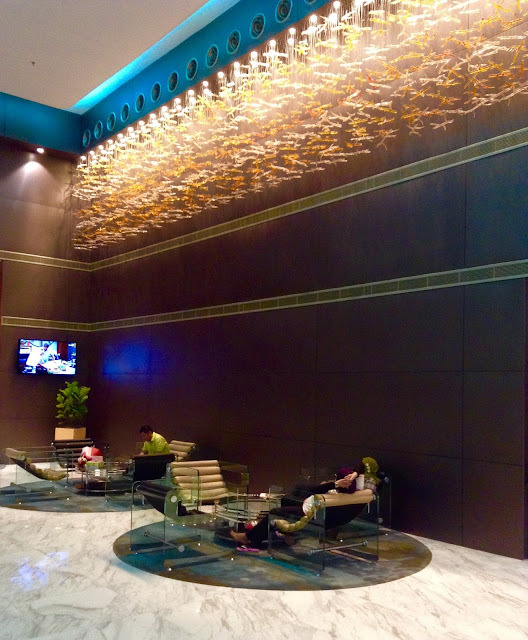 On arrival at LHPD, we were astounded by the spacious lobby, brightly lit with recessed lighting shining onto strands of coral. 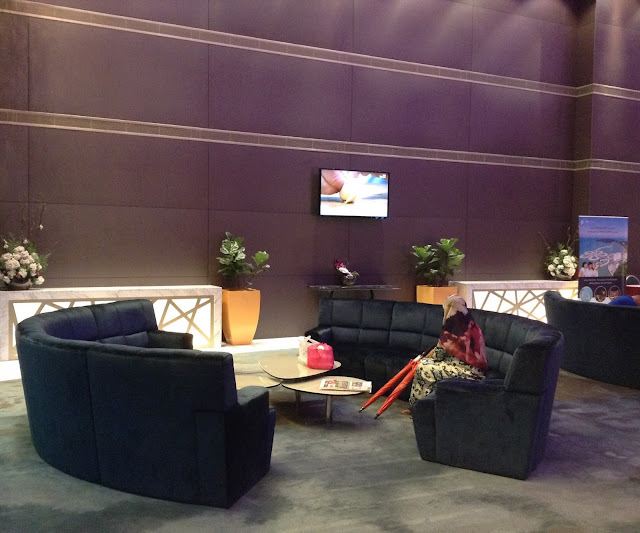 Plush seating areas offer brief respite for guests staying at the tower block who may need to wait their turn for check-in. Those staying in suites and Panorama Pool Villas are whisked off to the circular Lighthouse Club building for express, personalised check-in. The resort's 639 pool villas has garnered much buzz since opening. 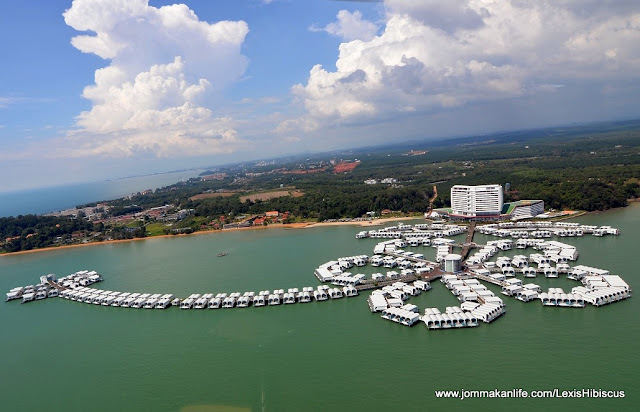 Whether day or night, the main tower block of 117 rooms stands tall, intersecting with clusters of 522 overwater villas that spread out seawards to form the outline of a hibiscus. We were indeed privileged to be accorded a Panorama Pool Villa (Sea View) during our recent weekend escapade. Each 88 sq.m unit is tastefully outfitted in warm, earth tones; the clincher is the private infinity pool and steam room in addition to a spacious patio with breathtaking, uninterrupted vistas of the sea. Comfortably furnished with two king beds, an expansive vanity area and bathroom, an executive desk and a sleek wall panel with flatscreen TV, we revelled in the luxurious touches (complimentary WiFi in-room, fresh fruit plate & soft drinks in the mini bar plus nightly turn down service) which made our stay utterly memorable. Next morning, we woke up before the crack of dawn to catch the sunrise. From our patio, the serenity and seascape laid out by Mother Nature was second to none. I even had time and the sheer luxury of going for a quick dip in the pool. By the time my dip was done, we were famished. Hitching a ride on the resort's shuttle buggy which plies to and fro at frequent intervals, we sojourned to the Lighthouse Club for a sumptuous brunch (9am-2pm) at Wave Dining. Service was personable, with the team proffering juices and hot beverages, and a selection of delicious cook-to-order mains. While our main courses were being prep, we sampled assorted housemade breads, yoghurt and overnight oats with chia seeds, preserves (pumpkin kaya anyone? ), pastries and coconut milk with sago & pandan panna cotta. The concise but varied mains including a vegan dish should please most palates. Hubby and daughter were delighted with The American Breakfast comprising grilled herbed sausage, cherry tomatoes & balsamic vinegar, and truffle scrambled eggs with baked beans. Supplemented by toast and little jars of yoghurt and overnight oats, it was a substantial brekkie. In line with its seaside surrounds, Something Fishy was most appropriate featuring salted fish mash topped with a sous vide egg, cilantro hollandaise salmon trout gravlax on bagel with cream cheese and onion, and spicy crab cakes with wasabi mayonnaise. This was a hefty serving good enough for sharing between two light eaters. I also enjoyed The Vegan option: barley risotto with scrambled tofu, chickpeas & cauliflower salad with green chilli dressing and roasted onion with sweet potato & black truffle proved imagination can take meat-free dining to greater heights. We love the encompassing view the circular picture windows accorded and couldn't resist taking loads of snapshots. Another brief buggy ride post-brunch took us to the main building for a tour of the Lexis Hibiscus PD. According to Lee Meng Hong, Dir of Marcomm, guests of the main block partake their breakfast at Roselle Coffee House, an all-day dining outlet. 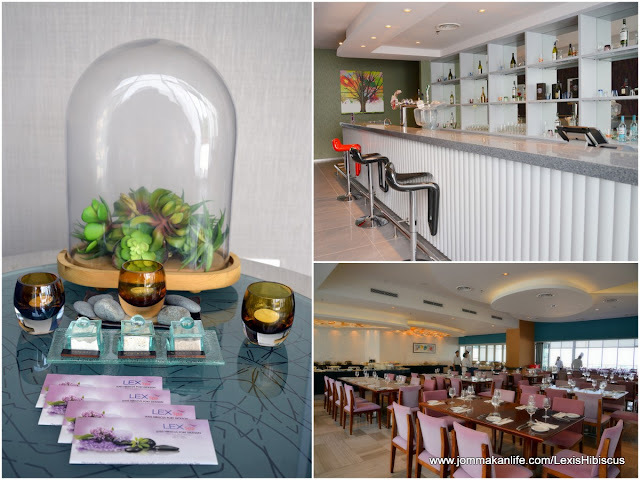 Lunch, dinner and weekend high tea buffet are served with dishes from around the world; a mixture of East & West specialities. Nearby is a recreational area where family-friendly activities such as archery and a rollicking yoyo car rides await. You can even rent Segway personal transportation vehicles or bicycles to zoom around the resort while kids can romp at the childsafe playground. 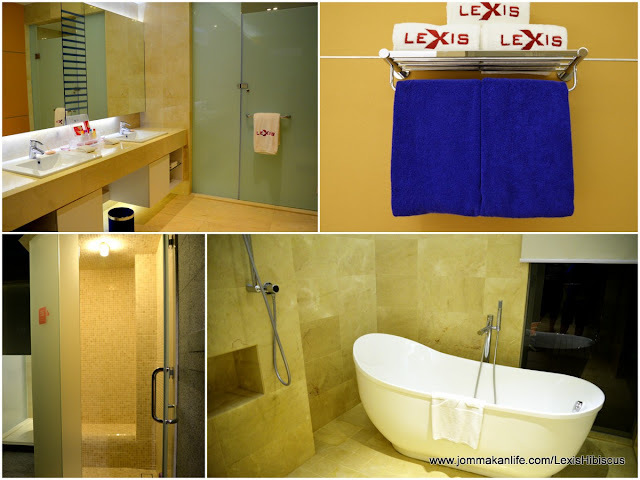 Keen to have a bird's eye view of the Lexis Hibiscus PD? Head over to the Main Lobby where you can sign up for a 5-minute helicopter joy ride (RM250 per person). This has its pull factor as many guests don't mind shelling out for such a rare experience. At the designated time you'd have to stroll over to the Hibiscus Heliport to embark on the helicopter ride. Let the children burn off some energy at Kidz World where they can climb, slide and crawl through an obstacle-like play area. Budding singers can warble their fave tunes at Starz Karaoke while blissful pampering in the serene oasis of LexSpa is available for ladies and men. We also had a whirlwind tour of the LHPD special event facilities. One of the outstanding features has to be the unique lighting outfitted throughout strategic public areas. 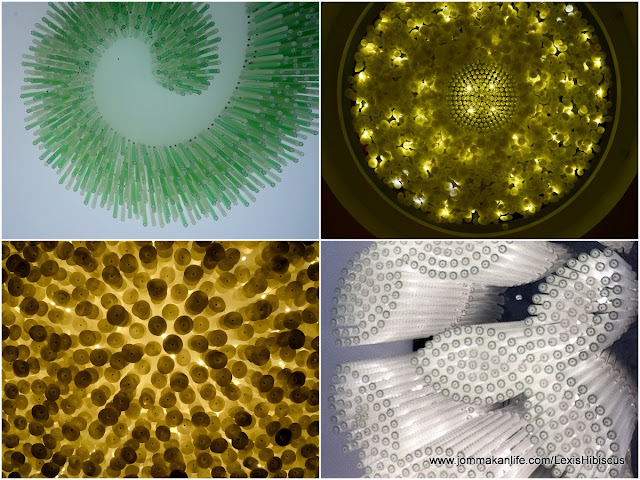 All of them are eye-catching and evocative of the undersea in the form and colours of corals and ocean life. Fans of Asian superstar Jay Chou would be thrilled to know the singer has called LHPD home briefly during his concert in Malaysia last year. He and his family were cocooned in the Presidential Suite, housed at the tip of the hibiscus stigma for privacy. The duplex abode has four bedrooms with ensuite bath, spacious living and dining area as well as a kitchen and bar. Likewise, the Royal Suite and Imperial Suite are filled with similar fine furnishings and creature comforts. The shutterbugs in us spent some time snapping pixs at every picturesque nook and corner. At dusk, we headed over to Lighthouse Bar - located on the highest floor of the Lighthouse Club - for canapes and drinks. The large, airy deck accorded us a nice view of the surroundings while we chilled and chatted over a selection of nibbles and tipples. It was a food-filled weekend for us since the LHPD team hosted two sumptuous dinners - one at UMI Japanese Restaurant and Wave Dining. Deets on our dining experience and the plethora of goodies we sampled will be coming up in a separate blogpost.